St Augustine’s served the inner part of Preston, which was built up in the late C19. The architect chosen in 1894-95 was G E S Streatfeild, with Sir T G Jackson, whose pupil Streatfeild had been, as consulting architect (CDG 13 (1895) p12), probably because Streatfeild was only 25. 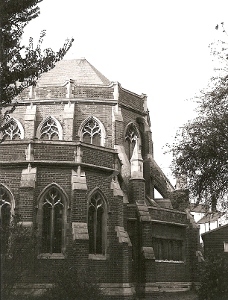 It is mostly in the Perp style, which had become acceptable by the 1890s, though the curvilinear tracery and undulating balustrade of the chancel are a marked contrast, and was built of brick. Reversing the conventional sequence of construction, which was to start with the chancel, the nave was completed within a year; the easternmost of its six bays is canted inwards to the chancel arch. The unfinished west end was intended to have a tall tower in the Somerset style (CDG 134 p16). However, the chancel remained unbuilt until 1913-14 (ICBS) and the tower which was to follow was never started. The chancel followed the design of 1894, but according to Goodhart-Rendel was overseen by ‘O Milne’ (AR 44 p78), who must be W O Milne, who had also taken a part in training Streatfeild. The ambulatory around the apsidal east end is unusual in a parish church; so are the low flying buttresses. South of the chancel is a low chapel. The church was declared redundant in 2002, and after a brief period of use by a Pentecostal congregation became once more disused. During this time there was structural damage caused by the theft of lead and work and work started in March 2015 on converting the church into a cultural and business centre which also included apartments. This involved much subdivision of the interior and of the fittings, only the stained glass is reported to have been kept (information from Nick Wiseman). 1. (South aisle) C E Kempe, 1901 (east window) and 1902, through to 1909. 2. (Ambulatory, south chapel and east clerestory window) Kempe and Co, 1912-21. 3. (Centre west window) Mayer and Co, placed here with other glass from the demolished church of St Saviour, Ditchling Road (BE(E) p280).